Alaska Pet & Yard Services - Your Professional Pooper Scooper and Lawn Care Crew!! RESIDENTIAL SERVICES AND RATES -"Wasilla and Palmer"
Felecia from Eagle River - WOW! I wanted to let you know I was very impressed with the awesome job you did with our back yard. Thanks so much! 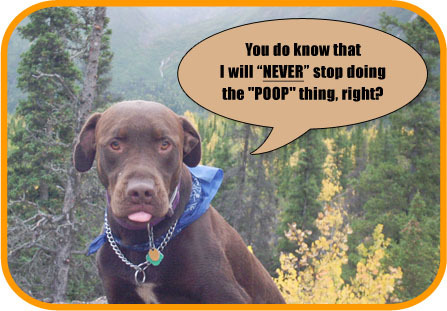 Lynn from Anchorage - I have had an ongoing contract with this group for dog poop clean up and summer lawn maintenance for several years. They are always responsive to any concerns and I have been highly pleased with their services. In the summer it is excellent to come home to a freshly mowed lawn and the spring thaw cleanup that is included in my contract is excellent. Let's face it you've got better things to do with your time! :-) Why not take your nastiest chore away for good? Click on how many dog's you have and discover how amazingly affordable this service is. - Initial Cleanup is free of charge! - Requires a 12 month commitment, but is paid month-to-month (not prepaid). - PLUS 13th month free! - Prepayment of 12 months required with this package. - Initial Cleanup: Standard weekly rate + $1.15/minute for any cleaning time over 30 minutes (All visible waste must be thoroughly cleaned during the initial cleanup). - Requires a 3 month commitment, but is paid month-to-month (not prepaid). PLEASE NOTE: Our billable time starts when we exit our service vehicle and stops when we get back in our service vehicle. Please note that you can tell us to clean until it's gone or set a cap on your billable service time (i.e Do not exceed two hours of billable service time). We do not provide estimates. Our rates are per man hour. Normally, we only send one service employee, but due to the high demand during our busy seasons you may see more than one service employee. Rest assured that our goal is to get the job done as quickly as possible (since we have over 5000 customers that use our services). EXAMPLE: Let's say you set a cap on your billable service time of 2 hours. If we send two service employees and they are there for a total time of one hour, this would equal two (2) billable service hours. The minimum purchase is $69.00. "Learn More"
Weekly Services: It's important to note that "We do not charge our clients overtime!" You pay a set monthly fee regardless if your service visits take 5 minutes or 30 minutes. You will never receive surprise overtime charges from us. This is true even during the spring season when all those canine treasures start popping up everywhere. what area's do you provide services to? For the Mat-Su Valley please click here . © Alaska Pet and Yard Services, L.L.C.